Very unexpected, Jolin appeared a few days ago in a French show airing on J-One (a French channel dedicated to Asian culture) ! Host: She’s beautiful, talented, and committed. Jolin Tsai is an extremely popular Taiwanese artist. Her music, her fight for women’s rights but also the pretty amazing cake she baked for Tom Cruise make her a media icon. We met her in her country, in Taipei more specifically, to know more about how she perceives music, her commitment to the LGBT community and how she perceives women’s status there. An uncensored interview in which we got quite a lot of little surprises but unfortunately, we can’t provide you a 10-hour long interview. Ok, let’s go. Jolin: Hello my name is Jolin Tsai. How are you doing ?? Voiceover: Sometimes in show business, calling someone a superstar is not enough anymore. A 20-year career, 13 albums, more than 25 million copies sold, hundreds of awards, Jolin Tsai is already a C-Pop legend. Inspired by American divas such as Whitney Houston, Mariah Carey and Beyoncé, the woman nicknamed “the Chinese Madonna” has imposed her reign and her showmanship. Jolin: Earlier on when I debuted, and even before that, Whitney Houston and Mariah Carey were part of the first Western artists that I discovered, so I used to sing their hits sometimes in singing contests or in competitions I was participating in. Once I performed on stage, and once I really started performing in concerts, Madonna became one of my role models, dancing-wise in particular. Another one of my inspirations comes from the book Pride & Prejudice. I used to see it like a common love story. But today I am aware of the social and psychological dimension of this book. When I am starting new projects or when I am trying to have a new take on things already there or habits that I have, I can sometimes be lazy or demotivated. But where I also have an incredible luck is that I can count on an exceptional team and entourage, they always incite me to excel myself. However, when I decide to start something I commit myself 100%. And that is what I want to give to my fans. I would like to convey to them this will to pursue their desires as far as they can, in order for them to put aside their doubts that can damper them. Voiceover: Ranking amongst the richest Chinese (celebrities) on a regular basis, Jolin Tsai is one of the most influential people worldwide. An aura that the Taiwanese artist chose to use to serve social and humanistic causes. We most notably saw her provide her support to the LGBTQ community. An even more admirable commitment when we know how much some Asian countries can be fearful when it comes to these matters. Jolin: A lot of my fans but also a lot of co-workers of mine are part of the LGBTQ community. Since I spend a lot of time with them, it was obvious to me to use my voice to support them. And I am glad that my songs could inspire them. In the end, making music and writing songs, it is not for fame and money. What matters is to know how we can change the lives of people who are listening to us. And that is my biggest motivation as an artist. I think nowadays Asian countries have become more tolerant towards homosexuality or towards the LGBTQ community. In the past there has been lots of conflicts and hatred about this. We could see or hear terrible news item. Today the handling of this matter and particularly in media has changed a lot. As if love was finally becoming the priority once again. We are learning once again to treat everyone equally. And I am very proud to commit myself to this cause and to be able to show my support. Voiceover: Pushing the boundaries of her solidarity commitment, Jolin is now tackling the defence of women and their rights. A message which could resonate far beyond her usual listeners now that the star is collaborating with world renowned producers and DJs. Head in the stars but her feet on the ground, Jolin Tsai just continues to listen to her heart. If you are more into watching than reading, Jolin Fans Club & 依林520@YouTube used my softsubs and uploaded the video on their YouTube channel. 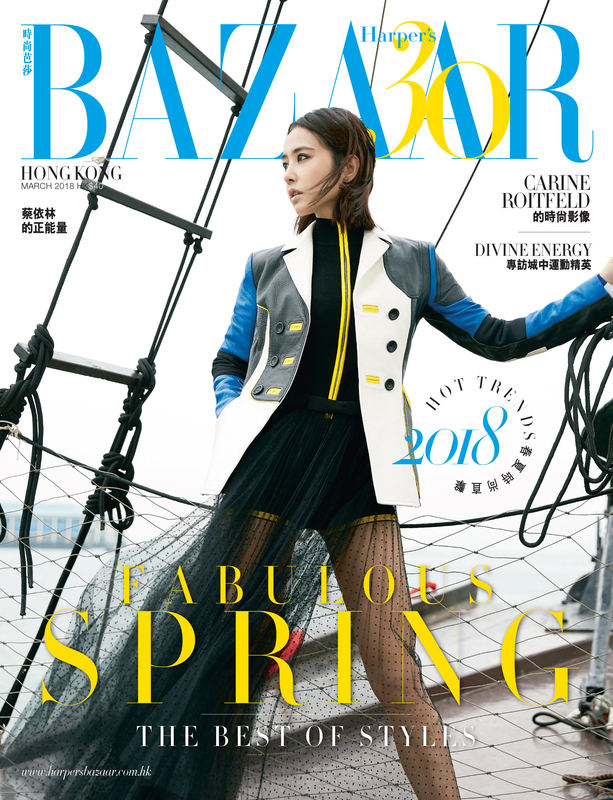 Jolin is on cover of Harper’s Bazaar HK March 2018 issue ! The last time she worked in such a cold environment was on the set of 假面的告白 Fake Confess MV. PLAY World Tour DVD/BD ranks #1 on 5music for the 4th week in a row ! Previous postJolin discharged from the hospital, a Tour was supposed to start in August ?